I can’t believe we’re already into the third week of the New Year. By the way, how are those New Year’s resolutions going? I have a few and one of them was to get back on track with my crochet hooks, they were collecting dust….lol. Well Alethia of Kassmins Creations quickly reacquainted me with my crochet hooks, when she mentioned that she'd crocheted a skirt. 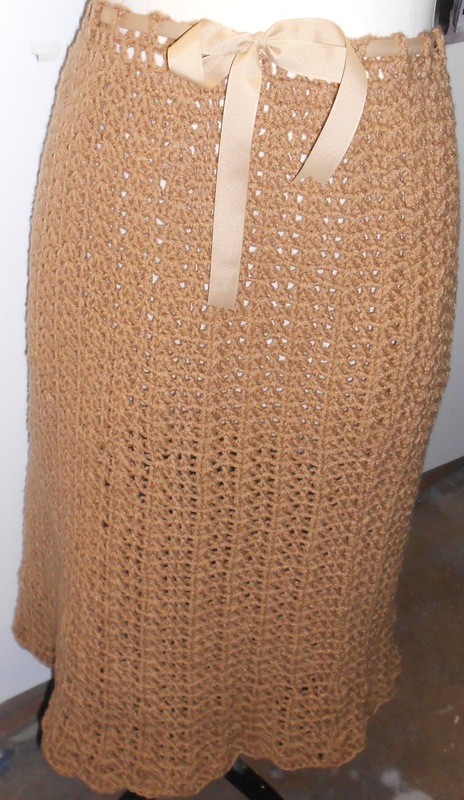 We (Alethia, Rachelle and I) talked further about the process and decided a Skirt Crochet Along ("SCA") would be a great idea and SCA was borne. I am sure all of you have some crochet hooks and even knitting needles pleading to be handled... the pattern is simple enough to be converted to knitting, so come aboard and have a lil fun. I know it will be a great success. Can't wait to see it. Oh that skirt is really, really cute ! I use to crochet everything, that was my second craft. It looks like an easy pattern though. I'm looking forward to seeing your finished product ! Hi Carolyn, Thanks. Actually I worked up a quick crochet pencil skirt to try the pattern stitch. Attaching the elastic tonight. I can't wait to see how it turns out! I knitted a few skirts a few years ago and i LOVE them. How fun! Ooh, you're throwing off my work flow! That's a gorgeous skirt - I could wear it over my leggings! Hi Lynneb, I just finished lightly steam blocking my test skirt... so far all is good. Hi Sister, wearing leggings under it would be perfect.